Thesys blows away bog-standard arpeggiators and the like, and when it comes to live work, it really shines. Great fun to jam with. Geared for live use. Versatile modulation section. Highly customisable sequences. Slightly fussy interface. A few minor bugs and omissions. Many DAWs offer standard arpeggiators and chord generators to 'bring life' to your MIDI sequences, but often these plug-ins are lacking on the usability and flexibility fronts. This is where Sugar Bytes' Thesys comes in - here we have an all-in-one MIDI sequencing tool designed with performance firmly in mind. At its core, Thesys is a step sequencer. In fact, it's not just one but five, each covering a different type of MIDI data and all running alongside each other. For each step (say, a 16th-note), you designate a pitch offset in the topmost sequencer, select its velocity in the one below and the gate time (note length) in the third. It's in these top three sections that you'll spend the bulk of your time, programming riffs and arpeggios, then assigning them to 'patterns' - hit a note and the selected pattern is pumped out, with these being transposed depending on which note you press. "Here we have an all-in-one MIDI sequencing tool designed with performance firmly in mind." Pitch selection also features a scale mode, so whatever you play, it'll be in the right key - the notes will simply be shifted up or down within your pre-selected scale. We discovered a few 'outside' notes creeping in when using the Aeolian scale, but Sugar Bytes assures us that this bug will be fixed in the next point update. The lower two sequencers are more unusual. Sequencer 4 is the Performance section and is divided into a further five rows, which offer octave shift, pitchbend curve, chord generation, roll (for baroque-style ornaments) and randomiser (for velocity, pitchbend and more). The final piece of the step-sequencing puzzle is the CC modulation section, and this is where things really get interesting. Each step accepts a value of 0 to 127, pumped out to a MIDI CC of your choosing. It's the sequencing equivalent of an LFO - but the fact you can draw in your own changes, rather than being tied to a preset curve, means your filter sweeps and tremolo rate tweaks can be far more exciting. While you'll probably start off using Eloquence's Modulation section to affect simple cutoff changes and the like, the potential of assignable CC data is huge. You can actually run several Modulation sequences simultaneously - up to eight - with all of them controlling different CCs. Thinking outside the box a little could give spectacular results at live shows - MIDI data can be used to control lighting rigs, too, so you could set up strobe 'stabs' perfectly synced to the riff you're playing, or even - dare we say it - trigger pyros! Moving across to Eloquence's right-hand panel, we have the Action section, which is a bank of eight buttons that you can hit to funk up and groove with your sequences in real time. The Gate Time button, for example, slams all your gate times to one step long, while Velocity Gate lets only the strongest notes through. Elsewhere on the right is Eloquence's onboard synth, which is a single-oscillator affair, packing a basic filter, some envelopes and a delay. 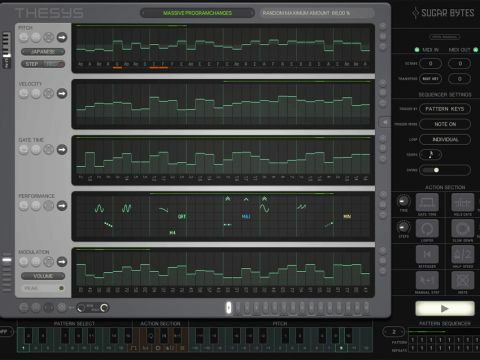 While you'll probably opt to use sounds from a dedicated third-party synth (by employing your DAW's routing to send MIDI from Thesys to the destination instrument), this native offering is fine when you're in a hurry. Patterns and actions can be selected via MIDI keys and there's also a selection of sequence presets. Even so, Thesys isn't a tool that you can quickly dip into, as sequence programming, by its very nature, takes time, and the interface can sometimes feel a tad fiddly. Other criticisms would be the lack of a proper note tie feature and the fact that, while you can set loop start and end points, you can't set an independent start point (ie, to play a complete sequence, then loop the end few steps). Still, minor grumbles and wishful thinking aside, Thesys has a lot going for it. Put the work in, and it'll make live sets a joy, adding genuine life and sparkle to your MIDI parts.